Ben 10 wants to collect all green spheres, but there are things that might prevent him from doing it. Draw a thin green line, so he could step on it and find the exit. 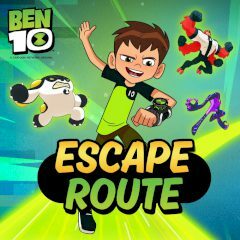 Watch how Ben 10 deals with his troubles, collecting green spheres around and dodging dangerous traps. When the counter is set to zero, he will run to the right. Create a green line so he could walk to the place, that was impossible to reach a moment ago. This sounds weird, but it true. Try it and have fun!